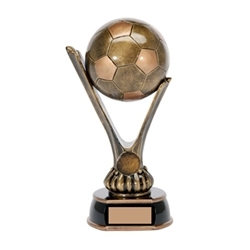 Soccer World Cup Trophies feature elegant soccer balls that are perfect for any award recipient from. This Soccer World Cup Trophy is available in 2 sizes so it is perfect as a unique soccer tournament trophy or special player award. We add your text in black on a gold plate which is set on the elegant base. The Soccer World Cup Trophies are sure to be an attention grabber at your next event! Small Size Height - 7.5"
Medium Size Height - 12"
Item Size 7.5" or 12"